When last did you have a romantic movie with your hubby? 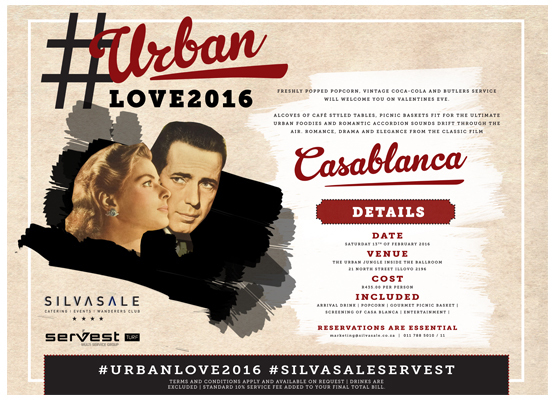 SilvaSale is giving away two tickets to their #UrbanLove2016 event on the 13th of February, 2016! SilvaSale Wanderers club was established by Pedro Silva and Marco Sale because of a deep passion for excellence and personalization to every event they handle. From the in house conferences at the Wanderers to large events hosted in various corners of South Africa. Their humble approach has laid the ground work for spectacular events. From private dinners to concerts no event is the same, but they are treated with the same family values and perfection as if it where their own event. Excellence is who we are…it starts from the core. Hubby nd I have been married for 5 years next year and we couldnt even go on a honeymoon as e had no money. this spoilt would be awesome even if it is just a movie. It’s time we get alone.